Wow where do I start? This book was cute, powerful, wise, reckless, fun…I could go on but I won’t torture those of you reading this with a huge list. I think you get an idea of where I’m going with this. 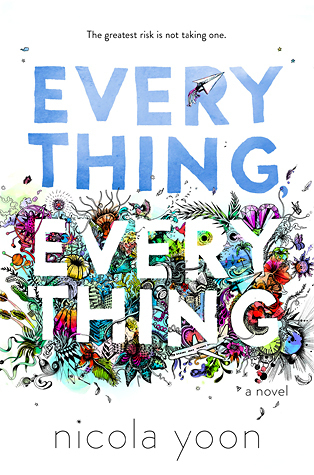 Everything, Everything was a little dose of everything (everything…I had to, it was right there on a silver platter). First let me gush about the characters. I loved them. Olly and Maddy are great leads and I definitely have a soft spot for Carla. The wit and silliness that goes back and forth between Olly and Maddy is so incredibly fun. One exchange I loved in particular is when they’re IMing each other and asking about eye colour. Olly wasn’t satisfied with “chocolate brown” so Maddy retorts with “75% cacao butter dark chocolate brown (ARC, pg. 51). It reminds me of something I’d say and I remember thinking “you go, girl! Show him that clever, funny side!”. I’m also a huge fan of the word heathen for some reason so the use of it in that set of messages was fun for me too. I also found some great life lessons and messages in the book. The idea that life isn’t life without experiences and doing different things, without failing and learning. Olly’s positivity in spite of his family situation is also a good lesson on optimism. One line I particularly loved from this novel was, “Into all lives a little turbulence must fall” (ARC, pg. 189) [I may have to add that to my list of next tattoos]. It’s so true and important to remember everyday and in everything that we do. One does not need to have a deadly illness or serious family problems to appreciate the wisdom in that sentiment. We will all face challenges, hardships, confusion, and the like. It is inevitable. What matters is what we make of it, whether it be learning what not to do in the future or even just learning our own strength and resilience from it. I loved watching Maddy’s world fill with colour as the story progressed and seeing her learn and process the information from her experiences. She was by no means perfect; between keeping secrets from her mom and doing rash, dangerous things. She manages to do “normal teenager things” even though she’s stuck in her house with minimal contact with other people. She makes me want to hug her one moment and then smack her upside the head the next and it’s part of what makes her character and her story so awesome. Everything, Everything was so full of feels! I do adore Olly but I have left him for someone else to claim as a book boyfriend. The bond between him and Maddy is so sweet…I’m talking Teddy Grahams dipped in icing sweet here. I don’t mind that it’s insta-loveish. If I were stuck in my house every day of my life and will be for the rest of my life, I’d totally cling to the first person I could get close to as well. Especially when they’re so accepting of one’s situation! Finally, can we talk about the format? I have ALL THE HEART EYES for how differently this book was set up. IMs, lists, notes, illustrations, super short chapters, paperwork…that’s just scratching the surface. It was so refreshing to be shown these things rather than told them. It’s also part of what helped me to fly through the book. Some of the pages only had a few lines and I even raced through the full pages because I never knew when a fun webpage illustration or FAQ would come up next. I love surprises so I loved waiting for those little breaks in the writing. It also makes the book that much more accessible for a reader who isn’t a fan of sitting down and consuming pages on pages of prose. This book and the format are definitely a teacher’s best friend!!! I think everyone can take something different away from this book. I happen to be in a “stuck in a rut” point of my life where some days I just feel like I’m on auto-pilot. Maddy was there to remind me to love what I have the opportunity to do, to understand that this is just a patch of turbulence but nothing more sinister than that, and to go out and have some experiences…to LIVE for real. I adored this books and fully intend to pick up a finished copy when my budget allows for it! I’m sure I’ll learn new things during rereads and when I come at it from a different point in my life. This book is everything, everything. Thank you! It definitely was awesome! It will be a staple on my shelf for years to come! I finished this recently, ohmigoodness, I loved it so much. Right?! So many different feels. So much love.